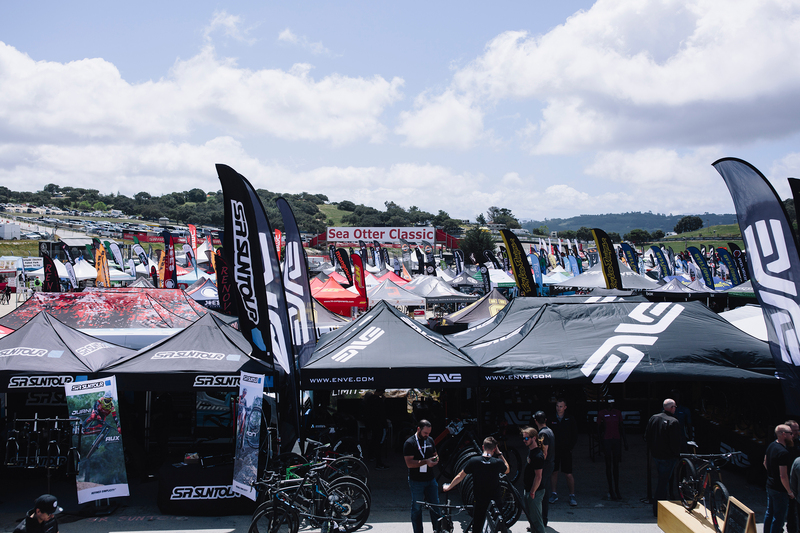 Last year’s Sea Otter Classic was a breather that I desperately needed and treasured. 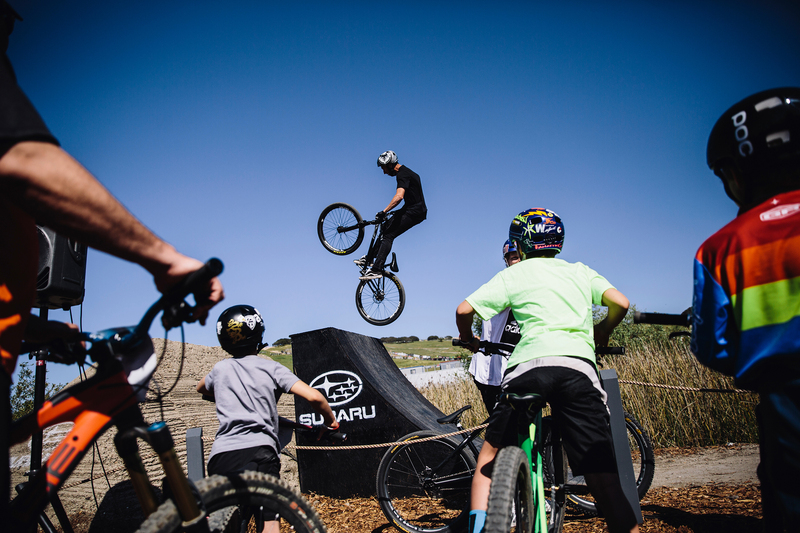 There was no PressCamp this spring so my schedule has been a bit bare, but as April inched closer, Sea Otter came tugging at my heart saying I should really go. Whether I like to admit or not, attending Sea Otter has turned into a yearly pilgrimage, an excuse to get out of town. Heck, it doesn’t even feel like work (until I have to sit down and type it all out). This year’s Sea Otter, or Sea Weasel as some like to call it, was in a way more or less the same: Always held on the third week of April at Laguna Seca, lots and lots of walking, the dust bowl. The only difference was that I spent two days there instead of the usual one so I that I could pace myself between checking out gear, trying to get some general photos, and even some racing action. If next year’s edition is as busy as this year’s then I think I need to be there for its entirety. Here’s a quick, off-the-cuff photo journal of my two days, minus the gear of course. First, the expo was lit. (Overheard at some point: InterBike’s dead.) I don’t recall seeing that many booths in past years and we were told by the organizers that all the booth spaces were sold out this year. I believe them because I kept getting lost. It was a great workout, but terrible when you have to run to an event or a meeting. You know those wavy flags that booths like to put up so they can be easily found? They don’t work because everybody’s got a few, if they didn’t get blown over by the wind, that is. Flag or flag-less, however, the place was buzzing. 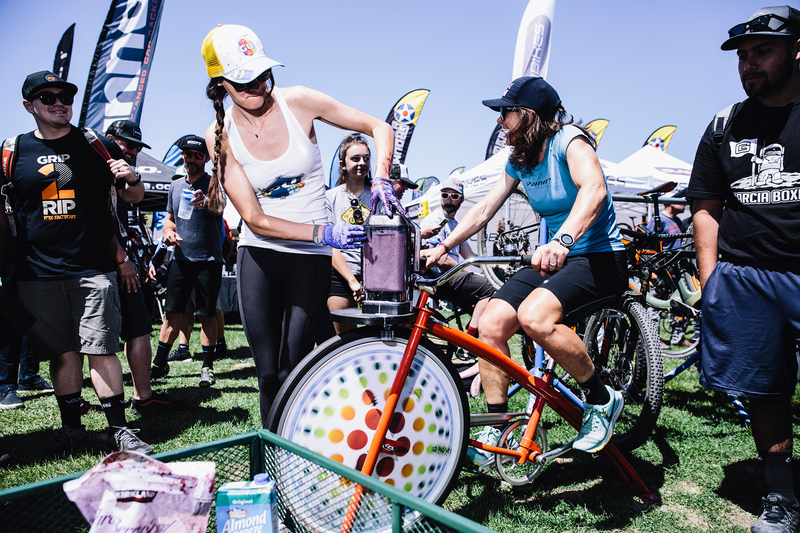 Look, there’s Rebecca Rusch talking about nutrition while cranking out smoothies effortlessly at the Clif booth, kids watching dirt jumps at the always popular Subaru booth. And how can I forget the happy hour giveaway raffle at Fox? Thankfully, no RC cars or Float 40 were thrown off the roof of the truck, much to the dismay of the bros amongst the huge, energetic crowd (who doesn’t like free stuff?). Steel is real and this gorgeous orange Von Hof Cross bike deserved to be placed high up for all to marvel at. 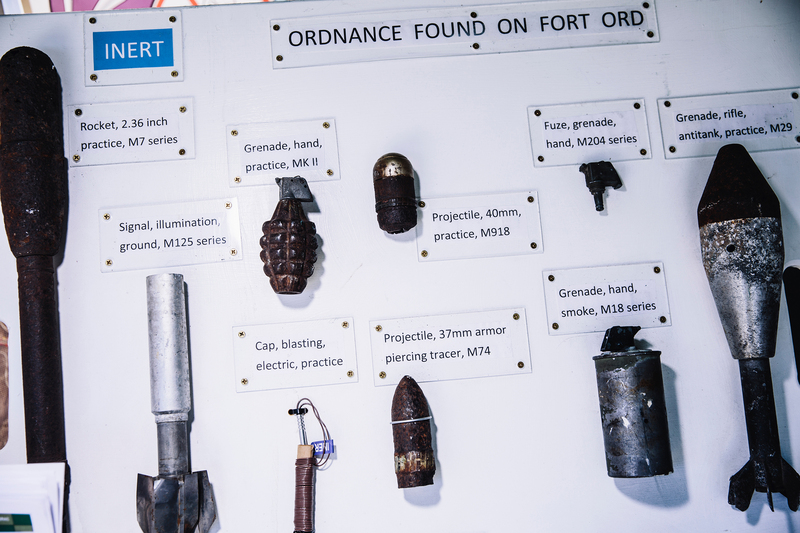 Not far from the Fox crowd, however, was this quiet booth with two whiteboards full of ordnances found on Fort Ord, where Laguna Seca rests upon. Now, the ones shown are obviously inert but they served as a great reminder to stay on them marked trails. 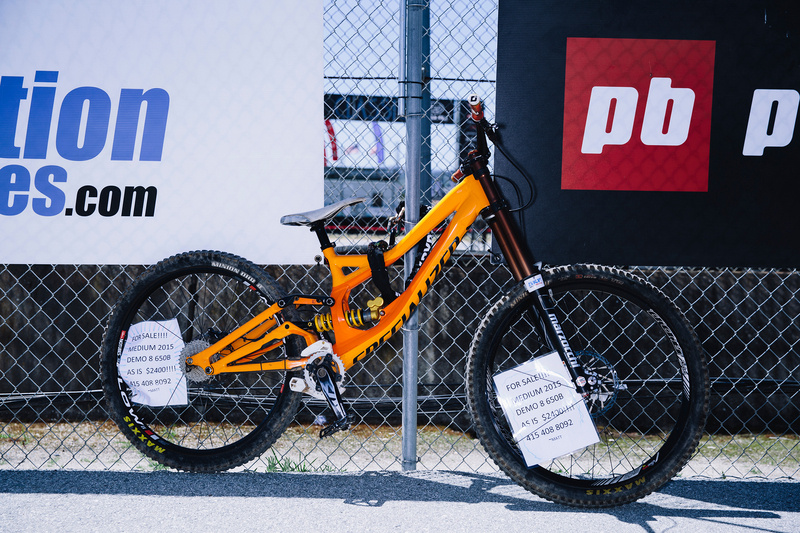 As visitors continued to trickle in on Friday, the number of bikes with for sale signs chained to various fences also increased. Matt, your Demo 8 looks sweet and all but do those roadside ads ever work? Asking for a friend. Besides the obvious information overload on gear, the riding portion looked good too. Throughout the first two days, I spotted plenty of juniors buzzing around on race courses going faster and being more enthusiastic and more organized in ways I only dreamt of when I was racing in their categories 15 years ago. I wish my parents would have allowed me to take days off from school to go racing, too. Nevertheless, it was an encouraging sight to see. The juniors warming up. Together. Team Swift with the 1-2-3. Moving on to pro racing. It dawned on me on the second day that Laguna Seca was a rather difficult place to photograph racing since getting from point A to point B “down the road” often means 15 minutes of walking in circles. My schedule was packed as if I were at InterBike, so I was only able to catch the pro women slugging it out on the short track aka criterium on dirt. The CLIF Pro Team were all smiles before racing in the Pro Women Short Track event. The kids were out to cheer for the women’s short track. 2017 US National STXC Champion Erin Huck (Construction Zone Racing-Scott) at the start line. 19 year-old Sidney McGill (Focus CX Team Canada) in the pain cave. But it was Courtney’s teammate Annika Langvad winning the event. That’s a lot of racers. 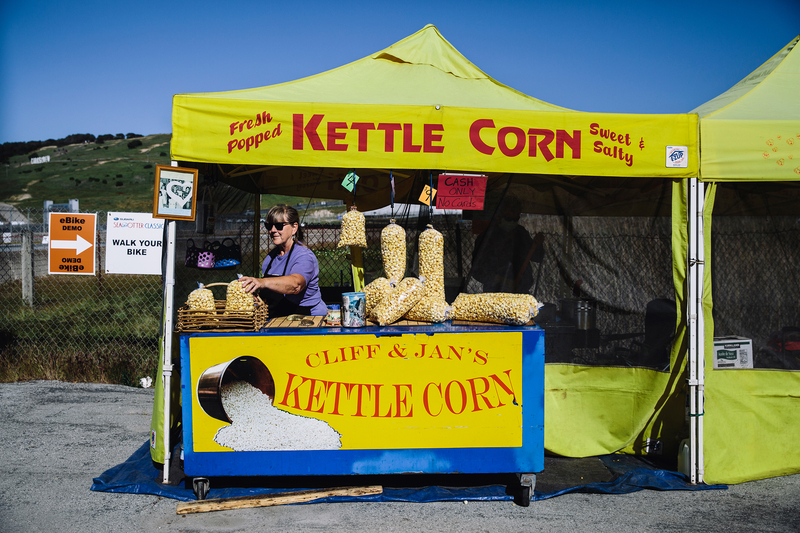 Lastly, don’t forget to pick up a bag of kettle corn from Cliff & Jan’s. Typically located at the bottom of the walk bridge off Wolf Hill, these two grade-school sweethearts have been steadily popping corns at Sea Otter for the past 12 years and I can’t avoid getting a bag year after year, much like attending Sea Otter itself.